Metalworking is the process of working with metals to create individual parts, assemblies, or large-scale structures. The term covers a wide range of work from large ships and bridges to precise engine parts and delicate jewelry. It therefore includes a correspondingly wide range of skills, processes, and tools. KGS Semi Flexible Aluminum Oxide (type A) discs grind fast on ferrous and exotic materials. 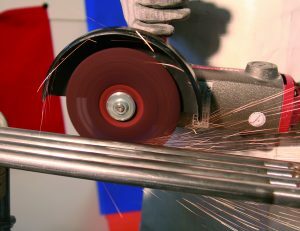 The flexibility and the layers of abrasives provide a versatile tool for grinding and dressing in one go for Metalworking. Ideally for fast weld removal on ship decks, repair of steel boats, and flattening or removing of welds on a flat surface. Ask a question or request for enquiry! Ask a question and we will try to respond as soon as possible.